NOTE: Our blog has moved! Please visit our new blog at https://www.venturescanner.com/blog to read up on our latest content. We cover many emerging markets in the startup ecosystem. We have previously shared a series of posts that summarized Financial Technology, Internet of Things, Bitcoin, Artificial Intelligence, and MarTech in six visuals. This week, we do the same with Real Estate Technology, but with 10 visuals. At this time, we are tracking 679 Real Estate Technology companies across 9 categories, with a combined funding amount of $12.1 billion. To see all of our Real Estate Tech related posts, click here! Market Overview: Breakdown of Real Estate Tech into categories. Number of Companies Per Category: Bar graph summarizing the number of companies in each Real Estate Tech category. Median Funding By Category: Bar graph summarizing median funding per Real Estate Tech category. Venture Funding in Real Estate Tech: Graph comparing total venture funding in Real Estate Tech to the number of companies in each category. 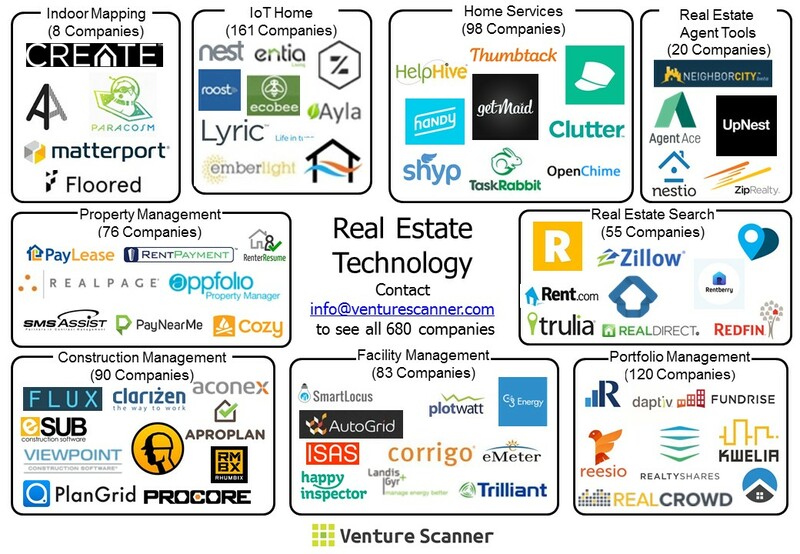 Global Breakdown of Real Estate Tech: Heat map indicating where Real Estate Tech companies exist. Median Age of Real Estate Tech Categories: Bar graph of each Real Estate Tech category by median age. 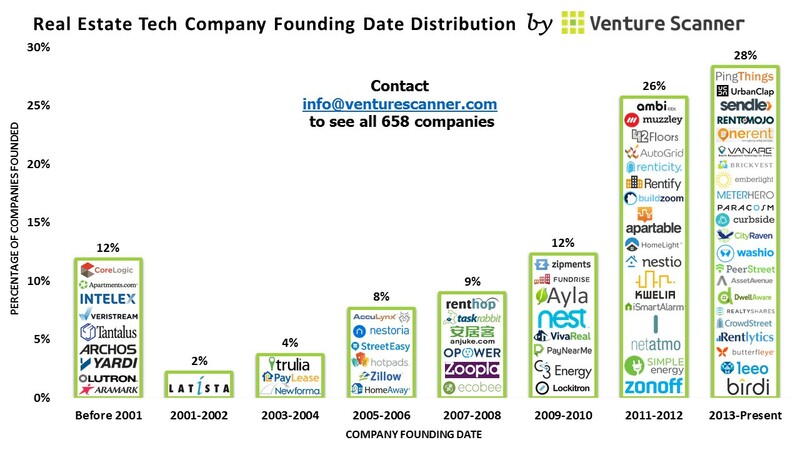 Founding Date Distribution: Bar graph indicating the years in which Real Estate Tech startups were founded. Funding by Vintage Year: Bar graph that indicates the level of funding in Real Estate Tech startups by vintage year. 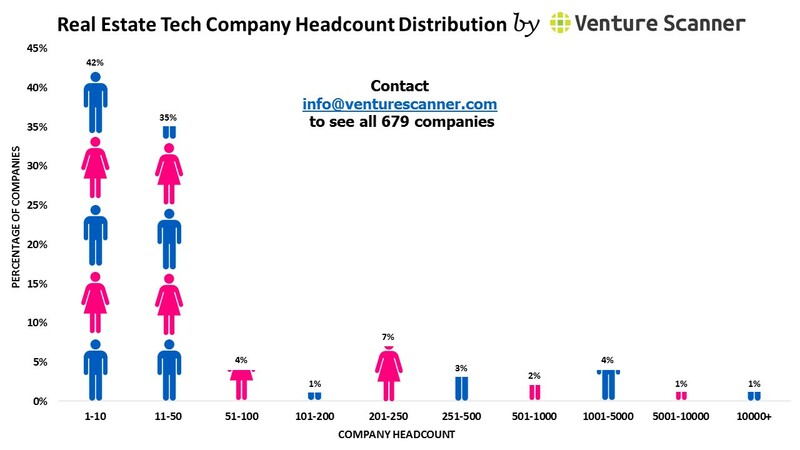 Company Headcount Distribution: Bar graph distributing the number of companies in different headcount ranges. Top Investors in Real Estate Tech: Bar graph indicating which investors invest in Real Estate Tech most frequently. Property Management: Technologies which help in the day-to-day operations of a building. Examples include approving tenants (background screening), electronic payment of rent, and maintenance. Construction Management: Technologies which help with the construction of new buildings. Examples include construction visualization, project management, and management of documentation. Facility Management: Technologies focused on building efficiency and long term sustainability, from large structures to individual home units. Examples include quantifying the building (energy usage, water usage, etc. ), making buildings more efficient, and building inspections. Portfolio Management: Technologies real estate investors use to help determine their investment strategies. Examples include property data trackers at the regional and local level, information on REITs, and real estate crowdfunding. Home Services: Technologies that support tenants in the management of their home. Examples include cleaning, renovation management, and postal services. Home/Apartment Search: Consumer tools that aid in the process of finding both short term and long term residences. Real Estate Agent Tools: Technologies that both help real estate agents do their jobs and technologies that effectively automate it. Indoor Mapping: Companies that help create indoor models of real estate. IoT Home: Internet of Things category focused on the residential segment. Solutions include home security, automation, energy management, etc. The bar graph above summarizes the number of companies in each Real Estate Tech category to show which are dominating the current market. Currently, the IoT Home category is leading the way with a total of 161 companies, followed by Portfolio Management with 120 companies. The bar graph above summarizes the median company funding per Real Estate Tech category. Again, the IoT Home category leads the way with a median of $19M per funded company. The IoT Home category is focused on the residential segment. Solutions include home security, automation, energy management, etc.. The graph above compares total venture funding in Real Estate Tech categories to the number of companies in each category. While Real Estate Search has the most funding at over $6B, it is IoT Home, Construction Management, and Portfolio Management that have the most traction in total startups. It’ll be interesting to see if funding in these categories grows in 2016. The following infographic is an updated heat map indicating where Real Estate Tech startups exist across 45 countries. Currently, the United States is leading the way with 450 companies. The United Kingdom is in second with 35 companies followed by Canada with 31. The bar graph above summarizes Real Estate Tech by median age of each category. The Construction Management and Facility Management categories are the most mature categories at a median age of 8 years, while IoT Home, Portfolio Management, and Home Services are the most emerging with a median age of 1 year. The bar graph above shows the level of funding in Real Estate Tech by vintage year. Real Estate startups founded between 2007–2008 have received $5.2 billion in funding. The bar graph above shows the distribution of employee headcount among Real Estate startups. Nearly half of Real Estate Tech companies are startups with less than 10 employees, indicating that this is in the early stages of innovation. 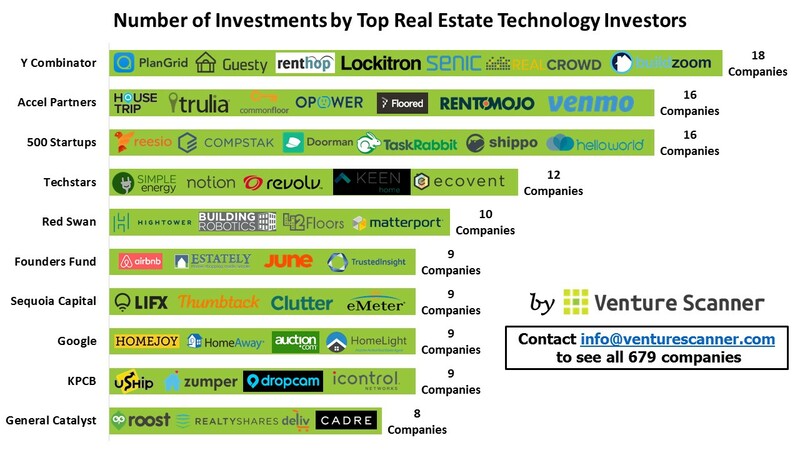 The graph above summarizes which investors invest in Real Estate Tech most frequently. Currently, Y Combinator leads the way with 18 investments, followed by Accel Partners and 500 Startups with 16 investments. As Real Estate Technology continues to develop, so too will its moving parts. We hope this post provides some big picture clarity on this booming industry. Venture Scanner enables corporations to research, identify, and connect with the most innovative technologies and companies. We do this through a unique combination of our data, technology, and expert analysts. If you have any questions, reach out to info@venturescanner.com. The following infographic summarizes the percentage of Real Estate Technology companies in each headcount range. It shows that companies with 1-10 employees lead the market at 42%, followed by companies with 11-50 employees at 35%. Please note that this data is based only on Real Estate Technology companies that have publicly available headcount data. We are currently tracking over 679 companies in 9 categories across 45 countries, with a total of $12.09 Billion in funding. 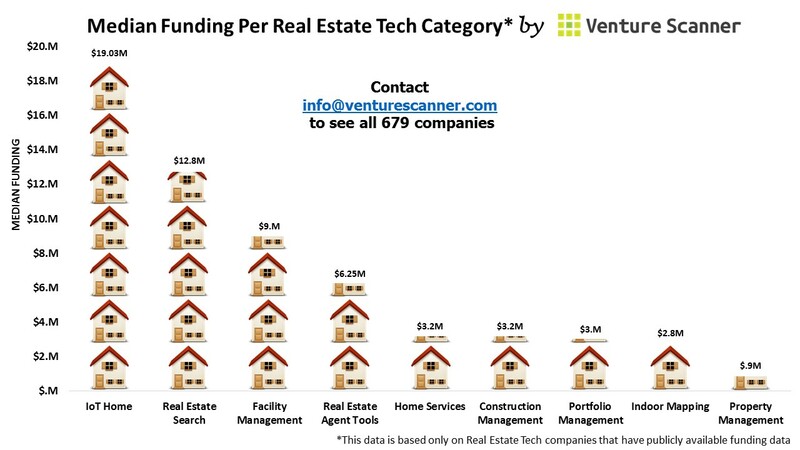 To see the full list of 679 Real Estate Technology companies, contact us using the form on www.venturescanner.com. 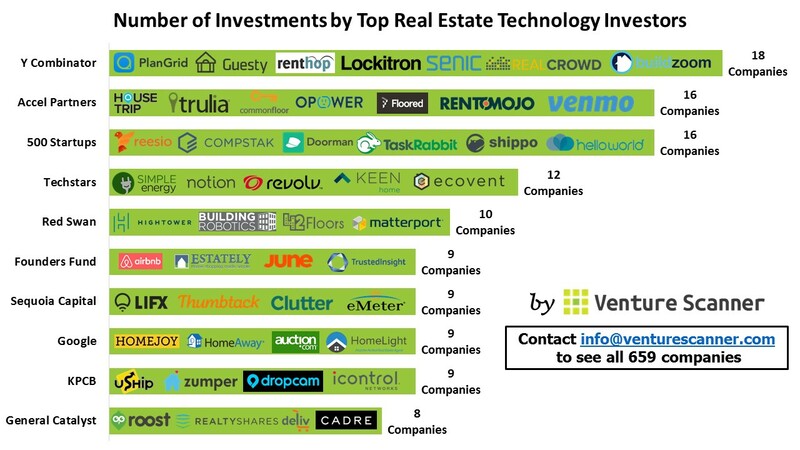 The following infographic summarizes the number of companies invested by the top Real Estate Technology investors. You could see that Y Combinator is in the lead by having invested in 18 companies, followed by Accel Partners and 500 Startups which each invested in 16 companies. 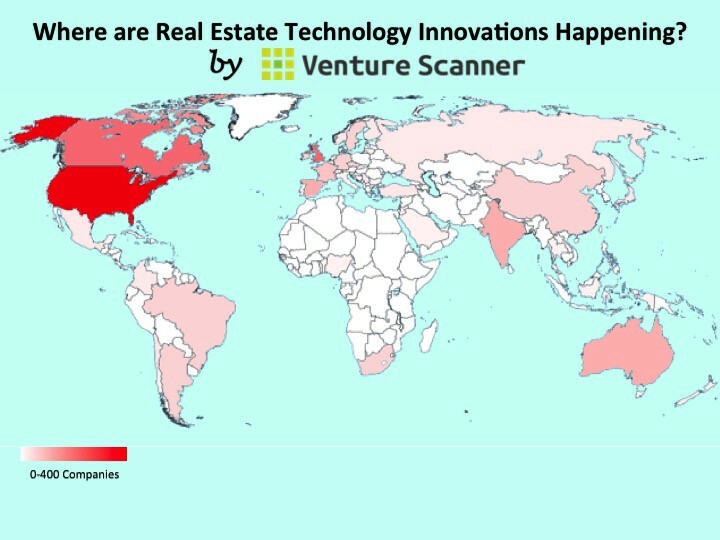 At Venture Scanner, we are currently tracking over 659 Real Estate Technology companies in 9 categories across 45 countries, with a total of $10.26 Billion in funding. 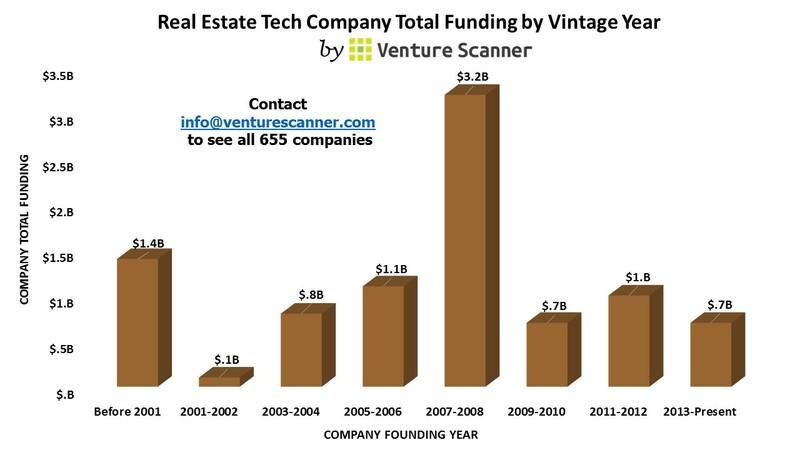 To see the full list of 659 Real Estate Technology companies, contact us using the form on www.venturescanner.com. The following infographic summarizes the founding date distribution of Real Estate Technology companies to show the percentage of Real Estate Technology companies that were founded within a specific time period. It shows that the founding of Real Estate Technology companies reached its peak from 2013-Present, with 28% of the companies being founded during this period. Company founding was at the lowest in 2001-2002, with only 2% of the companies being founded during those two years. We are currently tracking over 658 companies in 9 categories across 46 countries, with a total of $10.25 Billion in funding. 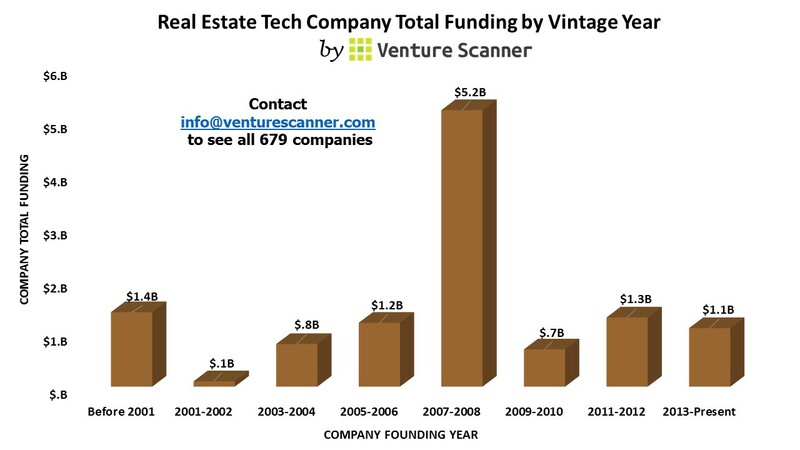 To see the full list of 658 Real Estate Technology companies, contact us using the form on www.venturescanner.com. The following infographic summarizes Real Estate Technology companies’ total funding by the vintage year they were founded in. You could see that Real Estate Technology companies founded in 2007 and 2008 are in the lead by raising a total of $3.2 Billion funding up to date. 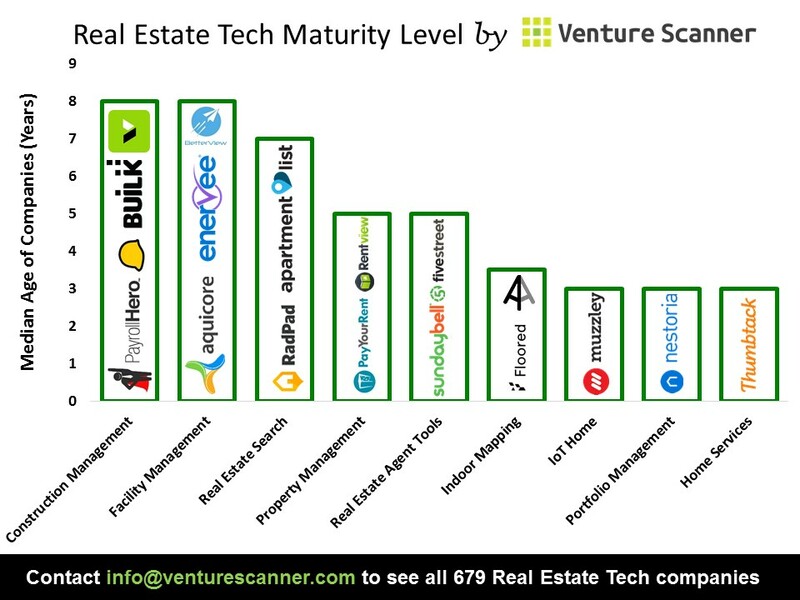 At Venture Scanner, we are currently tracking over 655 Real Estate Technology companies in 9 categories across 46 countries, with a total of $9.67 Billion in funding. 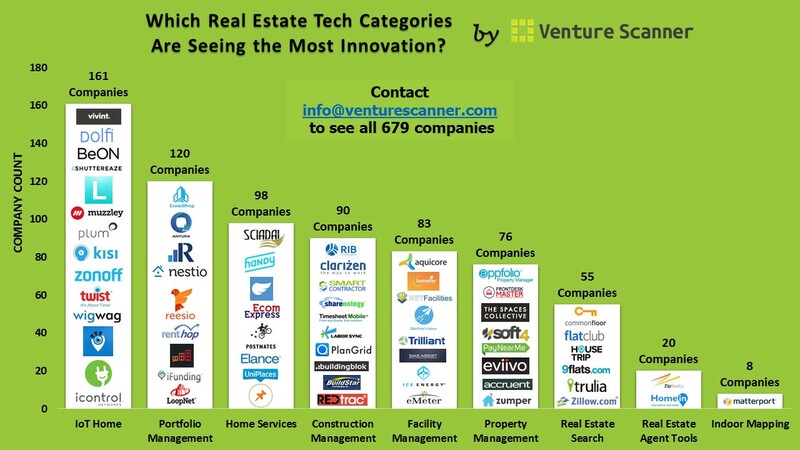 To see the full list of 655 Real Estate Technology companies, contact us using the form on www.venturescanner.com. Which Real Estate Technology Category is Most Mature? The following infographic summarizes our Real Estate Technology sector by median age of each category. The Construction Management and Facility Management categories have the highest median age at 8 years, followed by Home/Apartment Search at 7 years. Each category in our Real Estate Technology scan was created by our dedicated team of analysts who specialize in helping you understand the complex startup ecosystem. We are currently tracking over 642 companies in 9 categories across 46 countries, with a total of $9.5 Billion in funding. 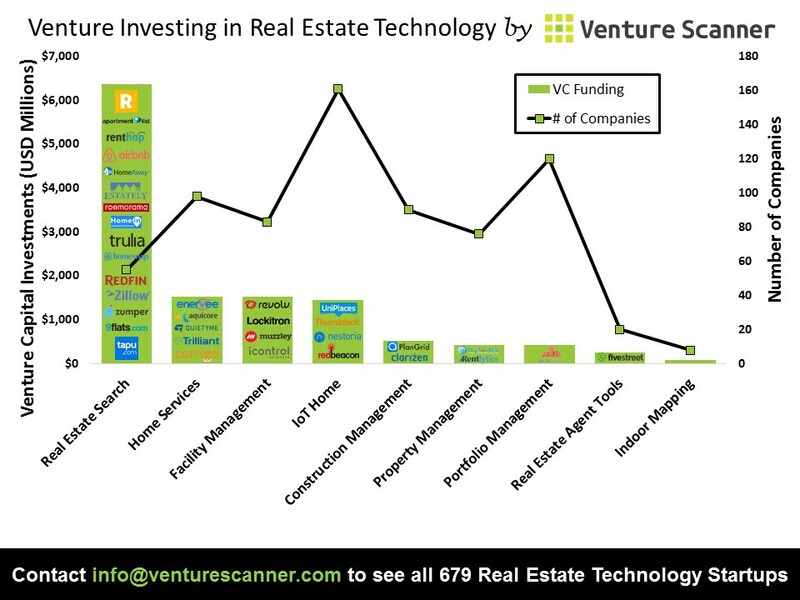 To see the full list of 642 Real Estate Technology companies, contact us using the form on www.venturescanner.com.